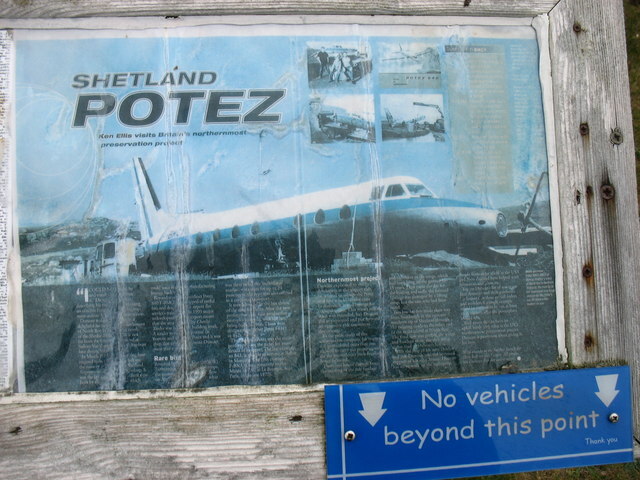 The "Shetland Potez" is a French plane which crash-landed at Sumburgh in 1981. The plane itself is in the next square east - see, for example, HU3790 : 'Plane Daft or HU3790 : Shetland Potez. This is not a very clear photo, but I submitted it as there is nothing better on site, and the plaque itself is deteriorating. I think that, if you zoom in, most of the text can be read, though possibly with difficulty. Above the plaque is a sign which reads "Land's End 747 miles". Well, Land's End is in SW3425, and I make it 748 miles. But these things depend on your exact basis of calculation, and 747 is close enough - to say nothing of being a number with much more resonance to aircraft fans!